Milan, located in northwestern Italy, is the country’s second largest city and its financial and industrial center. The city has the most global feeling of Italy’s cities, but with a somewhat grey pallor compared to the rest of the country. Older buildings often have a German or French style. 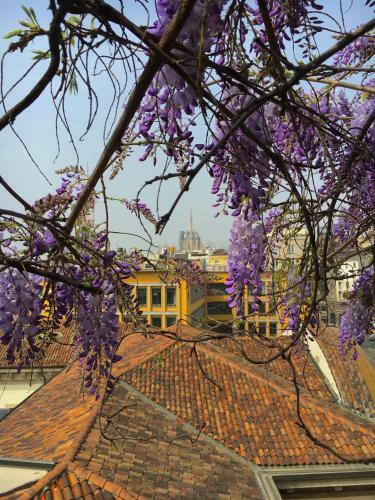 While much of Milan feels modern, it has a historic district well worth visiting: Cinque Vie. Among Milan’s most significant features is Leonardo da Vinci’s “The Last Supper” in the Church and Dominican Convent of Santa Maria delle Grazie, a UNESCO World Heritage Site. 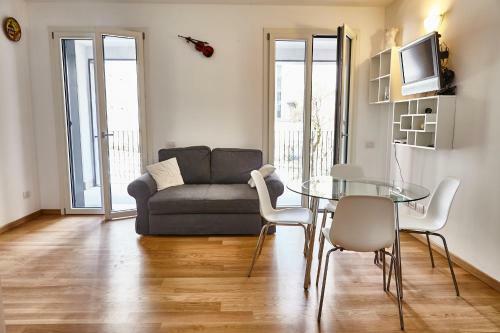 Music Suite Milan is an apartment located in Milan, 1.7 km from Villa Necchi Campiglio. The apartment is 1.9 km from Milan Fashion District. The kitchen has an oven and a fridge, as well as a coffee machine. A flat-screen TV is available. Average score from 681 guest reviews: 8.0/10. 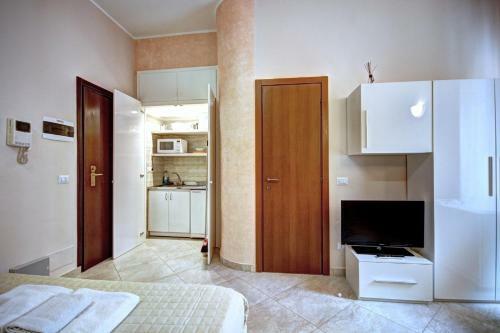 Bilocale Porta Venezia offers accommodation in Milan, 800 metres from Villa Necchi Campiglio. Guests benefit from free WiFi and private parking available on site. The kitchenette comes with a microwave and a fridge. Average score from 9 guest reviews: 8.1/10. Situated 1.5 km from Villa Necchi Campiglio in Milan, this air-conditioned apartment features free WiFi. Guests benefit from balcony. The unit equipped with a kitchen with a dishwasher and oven. Average score from 37 guest reviews: 9.1/10. The apartment is very clean and decent. Kitchen is fully equipped and location is fantastic. Actually everything was good , tha apartment was spacious and clean , metro stop was just few seconds called (( lama)) , the guy who gave me the keys of apartment was helpful and gentleman,as well as , he provided me many informations about cheap parking lot and many other , I highly recommend . The building itself is a bit old (the lift is really small) BUT the interior design of the apartment is modern. Most importantly, it is clean and comfortable. It is only a few second walk to the subway so it is very convenient. Best location, clean and safe. All the appliances are in good condition. В апартаментах есть все, что пожелаешь, очень чисто, чувствовали себя как дома, разнообразная посуда, мы даже дома так стол не сервируем, как сервировали там, совсем рядом магазин с различными итальянскими деликатесами, вообщем все было прекрасно!!! Спасибо огромное, редко за такую цену встретишь такой комфорт!!! Servizi da hotel a 5 stelle, posizione strategica. Ottima accoglienza, appartamento nuovissimo e dotato di ogni accessorio, posizione perfetta per shopping e turismo. Milano Apartments is situated in Milan, 300 metres from Duomo Milan. La Scala is 500 metres from the property. Free WiFi is provided throughout the property. All air conditioned, apartments feature a fully equipped kitchen and a seating area. Average score from 74 guest reviews: 9.7/10. Everything. Antonio extremely helpful answering our questions before arrival. Tina a lovely lady. Location marvellous. Fantastic location, loads of space, friendly welcome. We will be returning! very nice apartment in a great location. Clean, everything works. Quiet As the Windows overlook an enclosed area, which is a very interesting Museum - Biblioteca Pinacoteca Accademia Ambrosiana. I recommend to visit. Contrary to many flats I booked before, this one is well furnished with some food & drinks bought by the owners, which is pleasant. Antonio and Antonio treated us like family. When you travel with children that is very important. Excellent host! Mr Antonio went out all his way to make our stay such a pleasant one. Even the security officer, Mr Nadan was so friendly and helpful! Thumbs up to both of them. Location was fantastic with just 5-7 mins walk to the Duomo cathedral! Very comfortable beddings in the spacious apartment too! The apartment was absolutely beautiful with all the modern conveniences. 2 bedrooms with lots of closet space, 2 full bathrooms a very large kitchen with new modern appliances, and a large living room/ tv room. The location was perfect, and the apartment was very secure, just a few steps away from restaurants and relatable stores and The famous Milano Duamo /Cathedral. Anne was great also! She helped us in everyway possible with directions and any questions we had. I love that apartment and Milan. I would absolutely go back and stay there. Cosy home, friendly owner, best location, you have everything you need, even beer in the fridge! highly recommend! Thanks much for the quality! And moreover you can be sure that you are welcome here - 10/10! Location was excellent. 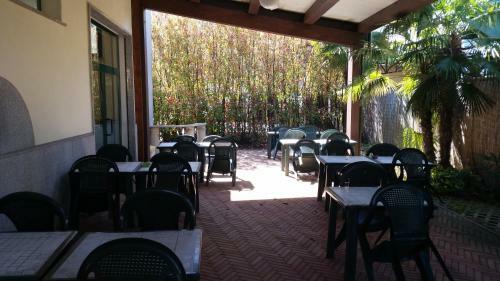 Close to the centre of Milan and easy walking to shops, nice restaurants, Duomo etc. But was surprisingly quiet at night. Anne was very welcoming, stocked the apartment with small snacks for breakfast. 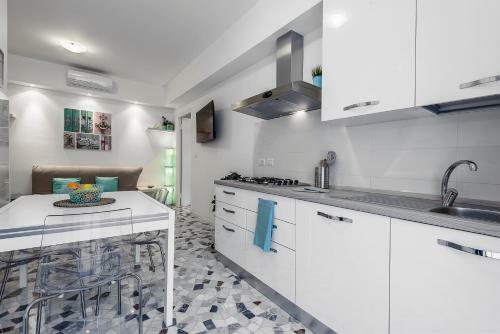 Spacious 2 bedroom apartment, recently renovated and modernly decorated. 2 blocks from the Duomo. Set 1 km from MUDEC in Milan, this air-conditioned apartment features a balcony. The unit is 1.7 km from Duomo Milan. Free WiFi is provided throughout the property. The kitchen has a dishwasher. Average score from 9 guest reviews: 0.0/10. See all hotels in Milan. BnB del Ferroviere offers pet-friendly accommodation in Milan. Certain rooms have a seating area to relax in after a busy day. You will find a coffee machine in the room. Average score from 24 guest reviews: 9.0/10. Location, free parking, spacious room and kitchen. È un posto bellissimo. Quel che amo di più di questo bnb è lo stile dell'arredamento e i colori. La nostra camera era molto spaziosa e dotata di un ventilatore. Il bagno era ottimo, pulitissimo e spazioso. La cucina era meravigliosa! Ogni cosa è curata nei dettagli. Mi sono sentita a casa! La proprietaria, la sig.ra Maria è stata gentilissima. Mi è dispiaciuto non poterci rimanere per più di un giorno. Spero di tornarci presto! Struttura molto ben curata e pulita. La ragazza che ci ha accolti davvero gentile e disponibilissima. Colazione semplice ma perfetta! A disposizione anche tutta la cucina, frigo, freezer... tutto ciò di cui avevamo bisogno insomma! Abbiamo soggiornato una notte in 4 per andare a vedere un concerto a San Siro, che dista circa 7-8 km. Terremo sicuramente a mente questo B&B per le prossime volte! Qualità/prezzo ottima! Ambiente super colorato e molto molto accogliente! Ospite molto gentile e disponibile! Da tenere in conto se si passa da Novate..anche per più notti per godere del giardino enorme! Calme , chambre donnant sur le jardin . Grande cuisine bien équipée (manque un micro ondes) . À 5mn en voiture de Milan . Gli strumenti musicali, l'arredamento fantasioso, la colazione abbondante e il cane Carota...spettacolare tutto!!! Ambiente molto bello,accogliente, essendo da soli avevamo tutta la casa disponibile per noi. L'area relax stupenda per ascoltare musica e rilassarsi. Un bel giardino. L'ambiente accogliente come quello di una casa e là disponibili di Teo che è venuto a prenderci alle 23:30 alla fermata di Comasina. 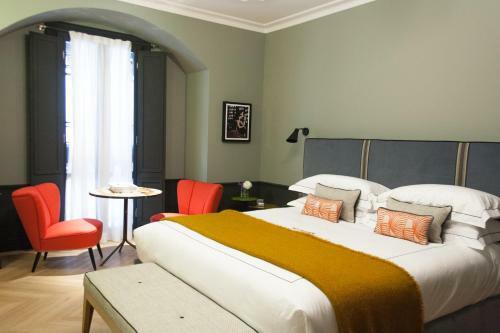 BOOK THIS HOTEL NOWSee all hotels in Milan. Featuring air conditioning, Rogoredo Apartment is located in Milan, 5 km from Villa Necchi Campiglio. Duomo Milan is 6 km from the property. Free WiFi is featured throughout the property and free private parking is available on site. Average score from 42 guest reviews: 8.8/10. Rogoredo Apts is a nice discovery we made via Booking.com (thanks for the great recommendation!) It has two relatively small one-bedroom apartments that are strategically located w.r.t. public transportation to both city center and the airport. They are fully equipped and well maintained: We found them perfectly clean on our arrival. The owner is one of the most welcoming people I've seen for all my years of travel: He was available (came to pick us at the metro station) and always helpful, ready to arrange any of our requests. The neighborhood is not the nicest you'd find in Milano, but has some valuable amenities: a pastry shop with tasty breakfast options, a supermarket, a small open-till-late shop, and a good number of restaurants (La Quercia is quite good). On Saturdays, there is a popular market along via Rogoredo where you can buy vegetables, cheese, pickled food, and even fresh fish. Simple and small apartment. Location perfect for me as working close by. I can fully recommend Rogoredo Apartment. The host was very friendly, kind and helpful. The apartment is small, but comfortable and very clean. Close to the apartment there is lovely caffeteria, where you can have a delicious croissant and coffee. The apartment is a 10-minute walk from the subway and train station. The apartment looks exactly like in the pictures, it's small, clean, with good WiFi and has everything you need. There is a supermarket very close and also the metro station is at 5 minutes walk and 8 stops to Duomo. The owner lives in the adjoining apartment and he was very kind and waited for us in front of the building. Proprietario gentilissimo. Appartamento pulito. Posizione ottima. Alloggio molto pulito e comodo ai principali servizi. Metro ubicata a pochi minuti a piedi e facile da raggiungere. Proprietario molto cordiale e premuroso. Consigliato! Mi è piaciuto tutto..dalla a alla z. Filippo è stato gentilissimo e disponibilissimo. il monolocale che ho preso io era completo di tutto, accogliente e pulito. Parcheggio per auto in cortile privato. Appartamento molto carino e pulitissimo a due passi dalla stazione Rogoredo, proprietario gentilissimo e disponibile. Perfetto anche per un lungo soggiorno. Situated 3.3 km from Villa Necchi Campiglio in Milan, this air-conditioned apartment features a balcony. 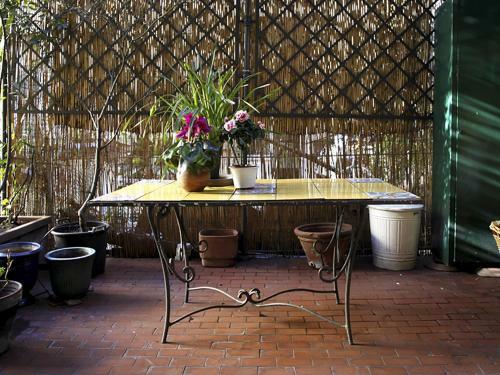 The property boasts views of the garden and is 3.5 km from Duomo Milan. Free WiFi is offered throughout the property. Average score from 37 guest reviews: 8.6/10. Easy check in, good communication (they emailed and phoned to check arrival time so they could meet us at the apartment). They let us check in early and were very helpful. Room was lovely, great location for getting the metro. Very comfortable for our family of five. Suited our needs exactly: one room for parents, one room for three kids. Very clean and new. Nice apartment complex. Good wifi. We were very glad we chose Alessia's flat instead of a hotel! Ampio appartamento situato non proprio al centro ma raggiungibile in pochi minuti con la metro che si trova veramente a due passi. Ben tenuto e pulito dotato di ogni comfort. Lo staff disponibilissimo e gentile ci ha anche permesso un late check out senza supplemento... credo che lo consiglierò sicuramente!!! La amabilidad de Alezia, la explicación de todo el apartamento, su preocupación por qué estemos todos muy cómodos. La dimensión de las habitaciones y su comodidad. La cercanía a la estación de metro. La posibilidad de poder aparcar gratuitamente en la calle. Camere comode a una zona tranquilla. Staff simpaticissimi! Bella vista dal 8° piano! Os quartos eram grandes e confortáveis. Cozinha ampla, banheiro limpo e amplo,máquina de lavar roupa e produtos de limpeza disponíveis. Próximo a dois grandes supermercados. Located in Milan, this air-conditioned apartment features free WiFi and a balcony. The unit is 2.8 km from Villa Necchi Campiglio. An oven and a fridge can be found in the kitchen. A flat-screen TV is available. Average score from 15 guest reviews: 8.5/10. Porta Venezia Studios Frisi 10 is an apartment situated in Milan, 1 km from Villa Necchi Campiglio. The apartment is 1.3 km from Milan Fashion District. Free WiFi is featured . The unit equipped with a kitchenette with a dishwasher and microwave. Average score from 23 guest reviews: 8.4/10. This apartment was a great choice.It was very clean, warm, well designed with everything you need of facilities and location is great. We would choose this apartment again. In a great spot that was easy to get to lots of attractions, with local supermarkets, bars and transport links. Perfect way to see Milan! Excellent use of space in a small apartment. Everything you needed for a short stay was there. Psychedelic lighting a bonus! Great for a small group of friends or a couple with young children. A good location for supermarkets and a great cafe across the road for breakfast. The metro is about 5 mins walk away, trams nearby. Don't get mixed up with the urban metro as we did. We walked into the centre first day but after that caught the metro. Had everything we needed in a good location with wifi and air conditioning. - Room was Very Clean and well equipped. - 200m from porta venezia metro station. - neighborhood was ok.. Carrefour is 200m which stays 24h. - the owner and his wife were very helpful and welcoming. The apartments are really small but the space is well organized, so my big family (7 person including a really small child) could spend a night there quite with pleasure. There is everything necessary in the room, and the host was ready to help us with everything. The location is very good, it is about 3-5 minutes from the Porta Venezia metro station (and from Porta Venezia itself). It takes 15-20 minutes to walk there from the cenral station (of course, if you know the way), and 20-30 minutes to walk to the centre (Duomo etc.). Отдыхали втроём в начале января 2017. От центрального вокзала идти 30-40 минут. Метро на расстоянии 10-15 минут. За углом магазин и неплохая пиццерия. В квартире есть всё! Холодильник, чайник, микроволновая печь, стиральная машинка, фен, плита. Очень милая квартирка! Два этажа- на втором этаже один большой матрац на двоих, и один одноместный. Несмотря на то, что без кроватей, очень удобно и хорошего качества. Внизу есть ещё диван. На 4 человека достаточно! 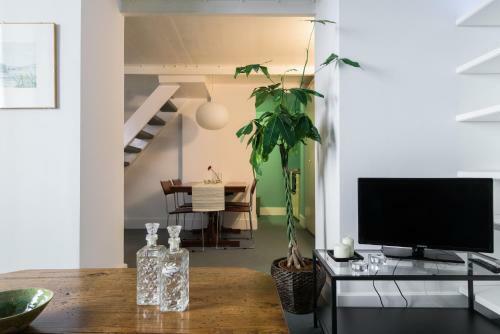 Set in Milan, this air-conditioned apartment features free WiFi. The unit is 800 metres from Brera. The kitchen is equipped with a dishwasher. A flat-screen TV with satellite channels is provided. There is a private bathroom with a bath and bidet. Average score from 114 guest reviews: 8.4/10. The location, mainly. Close to Garibaldi square and all that is there. 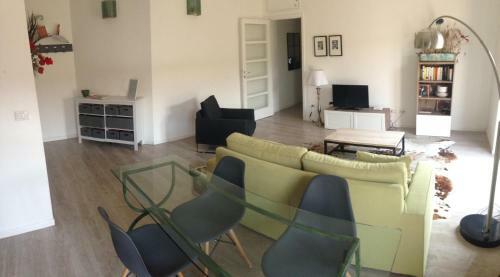 Amazingly spacious duplex on 4th floor in very nice residential area , only 10 min walk from Brera. Perfectly clean . Excellent location, spacious apartment, very fast internet, great area for sightseeing, drinking, eating and enjoying Milan. Very good furnished kitchen with all the necessary to prepare breakfast or cook some light meals. Great the check-in experience at the Milano Centrale railway station. The size of room was superb. It was huge and had all comforts. Beautiful apartment, and we were pleasantly surprised to find a large walk in wardrobe. Bed was very comfy and we had all the facilities we needed, and more! Highly recommend. The staff was extremely helpful. They answered all emails before our arrival. Portable wifi which we could use while sightseeing. The room is well-equipped. Quiet. Close to restaurants and cafes. Perfect wifi system(Tourist Wifi)! Very clean, large room. kindness to baby. The apartment was large, stylish and centrally located, and the building had a very nice inner courtyard. 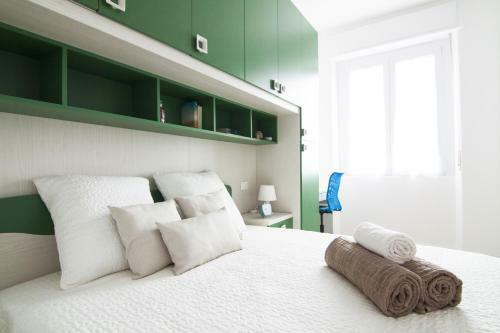 Located in Milan, this air-conditioned apartment is 1.4 km from Milan Fashion District. Napogiallo boasts views of the city and is 1.5 km from Villa Necchi Campiglio. Free WiFi is offered throughout the property. Average score from 57 guest reviews: 8.3/10. Great apartment in the attic of a very nice house. Equipped so that you can cook your own breakfast (Penny mini-market store, by the way, is just round the corner). 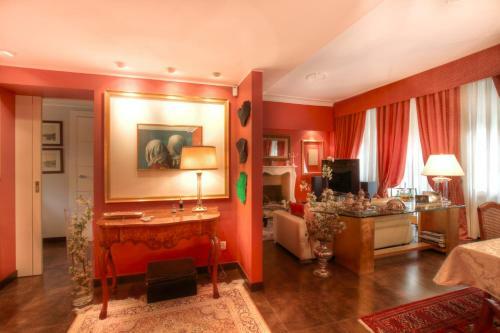 Location is superb, in a clean neighbourhood near Milano Centrale train station. Great for taking day trips (Como, 5-terra etc.) by train. 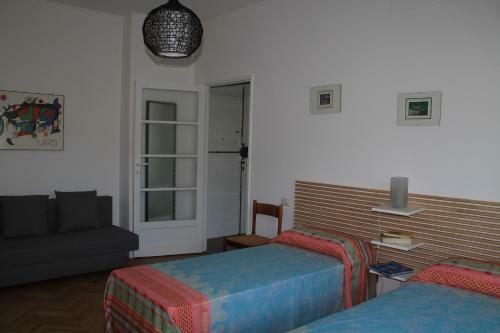 The apartmant is grear, and location is nearby Centrale. About 5 min walk. Удобное местоположение, рядом с вокзалом. До Дуомо 4 станции на метро. Отличный Wi-Fi, была даже Sony PS и куча игр. Апартаменты расположены рядом с железнодорожным вокзалом и станцией метро (5-7 минут пешком). Особенность - расположены под крышей, надо подняться на лифте на 5 этаж и еще один этаж по лестнице. Окна - в наклонном потолке, очень светло днем. Было тихо. Слева за углом большой магазин Panny market с хорошими ценами. Вся мебель и посуда ИКЕА, большое количество ножей для готовки. Посторонних людей нет, вход в подъезд мимо консъержки, в выходные дни подъезд открывается ключом. Есть утюг и гладильная доска. Featuring free WiFi, Ornato depandance offers air-conditioned rooms in Milan, a 10-minute drive from Bicocca Metro Station with direct links to Milan centre. Guests can enjoy all facilities of the sister property Hotel Ornato. Average score from 390 guest reviews: 8.2/10. The rooms were big and very clean, comfortable, the stuff was very nice, helpful and friendly. The hotel is located near the tram station and very close to a bus station, so you can easy get directly to the center or to the central station. I highly recommend this hotel. I have stayed in this hotel twice. And I always feel happy with the services here.The rooms are nice and clean. The price is reasonable. Staff in the hotel are really helpful. Though the location is a bit far from the city centre but it is easy to come back with public transport even during the night. very good for a city trip, almost in the heart of milan. Enough Parking space around the property. The staff of the hotel was very correct. The did not disturb us. But they helped in anything if we needed. The room was clean. The colors of the hotel is nice, we really liked it. Not a boring type. There is a tram on front of the hotel, so the public transport is also good. You can access easily to the city center if you want. Very clean, comfortable and modern room. Good, fresh breakfast. Excellent tea and pastries. Very polite staff. Staff was great, really good knowledge of English, great advice and suggestions. A great plus was parking at the hotel which is just behind it. Connection to the city is great. Tube is close by (10 min by foot) and tram stops in front of the hotel. In good location inside the city in the same street for metro . The staff was very helpful and respective and polite . The rooms are very clean . We were not planning to spend this night in Milan but after taking this night we were very satisfied and happy by staying inside this hotel . All the furniture in all floors are new . Thanks for every member working in this hotel . Located 1.9 km from Villa Necchi Campiglio in Milan, this apartment features free WiFi and a balcony. The air-conditioned unit is 2.5 km from Milan Fashion District. The kitchen has a dishwasher and an oven. A flat-screen TV is provided. Average score from 36 guest reviews: 8.2/10. Everything was awesome, from cleanliness and good smell to full equipped kitchen and perfect bedroom. Staying in this apartment was like living in your own neighbourhood in Milano. Huge balcony with the view to a small park in the back of the building made our morning. Thanks a lot! A modern house, close to main light metro and bus lines. «Appartamento molto luminoso. e in ottima posizione per il nostro viaggio di lavoro . Appartamento molto luminoso e in ottima posizione per il nostro viaggio di lavoro. krásné, prostorné, čisté!!!! jediné co bych mohla vytknout je horší parkování. jinak bezchybné!!!! Un apartamento lujoso y amplio. Muy cómodo y con todas las equipaciones posibles. Ключи от апартаментов передал агент Deshan,который пришел в назначенное время заезда,был с нами любезен. Апартаменты были очень просторные,вся мебель новая.Шикарный балкон с видом на парк! Недалеко находился супермаркет , который работал 24 часа! 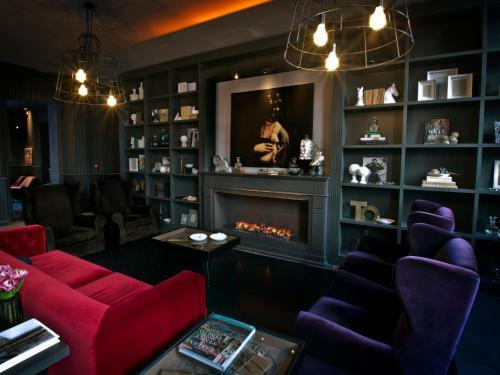 Featuring free WiFi throughout the property, Colazione da Tiffany offers pet-friendly accommodation in Milan. Each room at this guest house is air conditioned and is equipped with a flat-screen TV. Average score from 22 guest reviews: 8.1/10. Not many good things to be said. We were a bit disappointed, but considering location and price it was OK. Et rigtig fint B&B i en almindelig beboelsesejendom. Værelserne er hel ny-renoverede og meget pæne. Værtsfamilien er meget søde og hjælpsomme. Der et et hyggeligt nærmiljø med godt restauranter. For at komme ind til centrum tager man sporvogn nr. 1 som kører lige ude på Via Sempione. Den er ca. 100 år gammel og et oplevelse i sig selv. La cortesia del personale prima e dopo il soggiorno lodevole. L'arredo dei locali molto di buon gusto ma la cosa più apprezzabile la pulizia veramente minuziosa . Sowohl das Zimmer als auch das Badezimmer waren sauber. La camera era molto pulita, la struttura era nuova. Ottima la presenza del balcone in camera. La gentilezza e la disponibilitá di Monica e Marco. La posizione ottima per la comodità ai mezzi di trasporto. Set 1.1 km from Arena Civica in Milan, this apartment features a balcony with garden views. The apartment is 1.2 km from Brera. Free WiFi is featured throughout the property and private parking is available on site. Average score from 11 guest reviews: 8.0/10. 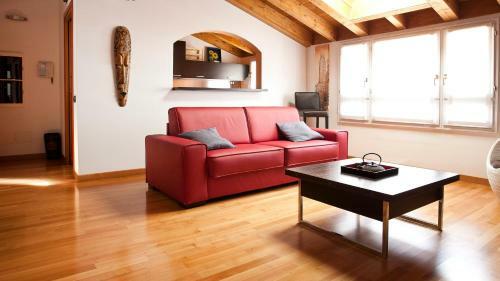 Lecco 11 Apartment is an apartment located in Milan, 1.1 km from Milan Fashion District. The apartment is 1.1 km from Villa Necchi Campiglio. Free WiFi is featured throughout the property. Average score from 5 guest reviews: 7.7/10. 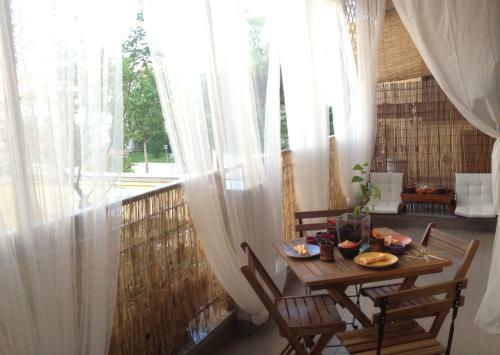 Situated 1.9 km from MUDEC in Milan, this apartment features free WiFi and a balcony. The apartment is 3.1 km from Duomo Milan. The kitchenette has an oven. A TV is provided. La Scala is 3.4 km from House Navigli, while Sforzesco Castle is 3. Average score from 11 guest reviews: 7.7/10. Featuring free WiFi throughout the property, Duomo 15 minuti offers accommodation in Milan. The property is 2.9 km from Ospedale Niguarda and 450 metres from Turro Underground railway station. Rooms come with a flat-screen TV. Average score from 24 guest reviews: 7.6/10. Very good location,good connection with city centre by metro. Perfect service and very nice staff. Domacin je korektan, smestaj je bio cist, boravak je bio prijatan i opusten. L'appartamento è in una zona tranquilla e vicino alla fermata della metro. La stanza confortevole e pulita. Sicuramente una buona base d'appoggio dove riposare tranquillamente dopo una giornata passata in giro. Ho soggiornato con una mia amica per due giorni. Si condivide l'appartamento con il signor Marco che ci abita e si ha accesso solo alla propria stanza e al bagno privato esterno.Marco è una persona molto precisa e discreta e come tale fornisce rispetto e ne richiede molto.Ambiente pulito e ordinato e bagno con doccia grande e spaziosa.Non dista molto dalla metro e per la colazione quasi sotto casa c'è un bar che ha dei cornetti favolosi. Очень близко к станции метро, до центра ехать совсем недалеко! Рядом с местом несколько прекрасных кофеен, где мы по утрам выпивали по чашечке капучино и съедали по свежайшему круассану! Featuring free WiFi and air conditioning, Central Station Milano Suites & Apartments is located in Milan, 400 metres from Milano Centrale Train and Metro Station. Milan Fashion District is 1.5 km from the property. Average score from 114 guest reviews: 7.6/10. The building is new. The appartment is nice. The location is excellent. good apartment of support, 5 minutes from the station and many other public transport! and I liked the decor and the interior light. I'll keep in mind for my next trips! Near to the public/metro station access. Fast checkin and checkout. The location is a central of Milano, very easy to access the pubilc transport. The apartment was located in a new building, very clean and spacious. Loved the floor heating and location. If you plan to stay longer, the apartment is equipped with everything you need. Flavio responded to our request for help in the middle of the night for a medical emergency. He was fantastic and really went above and beyond what would have been expected. Thank you so much. Great location, a new property with all ameneties for a comfortable stay. Besides the staff is kind! Must give this a try ! Excellent location. Nice bars and restaurants in locality. Called the number and the agent was there with the keys when we arrived. Easy process. Apartments Rubens 19 is located in Milan, 1.8 km from Fiera Milano City. San Siro Stadium is 2 km away. Free WiFi is available . The accommodation is air conditioned and has a flat-screen TV. There is a seating and/or dining area in some units. Average score from 55 guest reviews: 7.5/10. Location is near the Metro. Property size is big and has everything you need, especially for us who prefers to cook our own breakfast. Supermarket is just a few steps away. Really beautiful apartment. We really enjoyed the natural light in every room. All the facilities were very good. Easy to get to with lots of restaurants and metro close by... Would highly recommend for traveling couples! The staff is incredibly helpful and friendly, with possibility to reach them 24/7. The location is also very good, the metro station is 10 minutes away and you only need to travel for about 10 minutes to reach the city centre. Very spacious apartment, good furniture, everything is new and clean. Good location - not far from Milano Fiera and from the center. Metro is situated five minutes by feet, there are lots of bars near the house and also good restaurants. It's possible to leave your luggage at the reception after the check out. The place is calm, not too much noises and there are lots of things around. Good shopping stores, bars and restaurants and pasticceria, supermarkets and public transport nearby. The location is nice. The apartment is modern and spacious. Lokalizacja wyśmienita! do metra dosłownie kilka kroków. Obok hotelu ogromny Carrefour i inny market. Appartement très spacieux et confortable ! Dispose de sa propre connexion internet ! Pas trop loin du métro, on arrive au centre en moins d’une demi-heure. Pizzas délicieuses juste à côté ! Set in the Navigli area, a 15-minute walk from MUDEC museum, Villoresi Apartment offers accommodation in Milan. Free WiFi is provided throughout. The kitchen is equipped with an oven. A TV is offered. Average score from 13 guest reviews: 6.2/10. Set 1.1 km from Milan Fashion District in Milan, this apartment features free WiFi. The property boasts views of the garden and is 1.2 km from Villa Necchi Campiglio. A flat-screen TV is offered. Brera is 1. Average score from 135 guest reviews: 9.5/10. Situated 1.2 km from Navigli in Milan, Leonardo's Studio is an air-conditioned apartment with a private terrace. The apartment is 2.6 km from Duomo Milan. Free WiFi is offered throughout the property. The kitchen is equipped with a dishwasher. Average score from 11 guest reviews: 9.2/10. Прекрасные апартаменты! Чисто! Есть все необходимое для проживания! Даже кофе машина с капсулами! ))) Валентина отзывчива и дружелюбна! Помогала решить все вопросы! Расположение очень удобное, прямой трамвай до центра! Рекомендую! Grazie mille! Perfetto! Appartamento nuovissimo, super confortevole. Prenotato poche ore prima dell'arrivo, la host è stata molto disponibile! شقه من غرفتين سرير شخصين وصوفا تتحول سرير لشخصين ، الشقه نظيييفه ومتكامله من غساله ومطبخ .صاحبة الشقه متعاونه جداً وبغاية اللباقه واللطافه وبالطابق الارضي وبدون درج . مشي ثلاث او اربع دقايق للترام او الباص . Sehr nette Vermieterin, sehr saubere Wohnung, alles da gewesen, was man braucht (in Zimmern, im Bad, in der Küche), sehr warme Wohnung (wir waren im Winter, nachts bis -2 Grad gewesen), separater Eingang, Erdgeschoß (überhaupt keine Treppe), sehr hohen Decken, Einkaufsmöglichkeiten um die Ecke (100 m), ca 1 km entfernt war ein 24h Laden. Die Vermieterin war sehr hilfsbereit. Am Anfang gab es ein paar kleine Probleme, die Vermieterin hat sich sofort darum gekümmert. Das finde ich echt Klasse. Le prix très bas pour 4 personnes, La situation, l'équipement, le service le personnel, l'accueil, La température, La deco, l'espace. 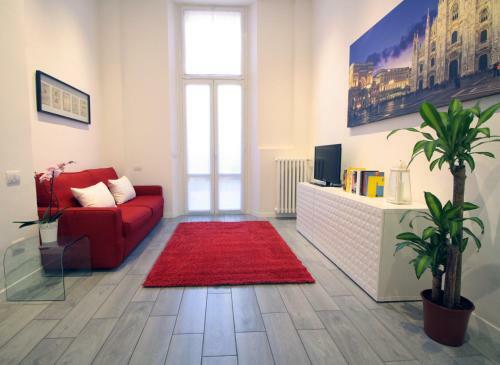 Located 1.3 km from Duomo Milan, Via Orti Apartment offers accommodation in Milan. The apartment is 1.5 km from Villa Necchi Campiglio. Free WiFi is offered throughout the property. There is a dining area and a kitchen. Average score from 25 guest reviews: 9.0/10. The location is very convenient, close to two subways stations and with several places to have good meals around. The flar owner was very gentle and helful. The flat is totally renewed, clean and comfortable. I would definetely recommend! Good location and neibourghood, 20 minutes to Dome. Все понравилось. Метро рядом 5 минут пешком. Чисто два душа. TEMİZ VE RAHAT. ALAN YETERLİ. METROYA ÇOK YAKIN. MERKEZE YÜRÜNEBİLECEK MESAFEDE. 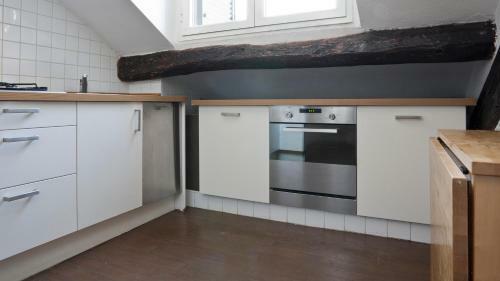 Appartement parfait: propre, 2 salles de bains, 2 wc, 1 chambre, clic clac salon très confortable. Etions un couple avec 2 enfants. Très pratique. Très bon emplacement. Posizione strategica, location con tutti i comfort, arredamento moderno e pulito. La posizione rispetto al luogo che dovevo raggiungere L'appartamento ben dotato, pulito e comodo. Sehr neue und saubere Wohnung. Relativ zentral. Nähe zu Strassenbahn und Métro. Sehr hilfsbereiter Eigentümer. Viele gute Restaurants in Gehdistanz. Located in Milan, this air-conditioned apartment features free WiFi, a spa bath and a terrace. 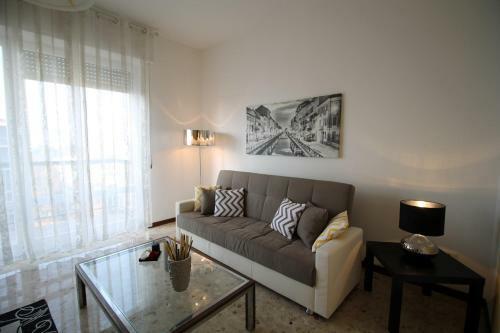 The unit is 900 metres from Milan Fashion District. There is a dining area and a kitchen equipped with dishwasher. A flat-screen TV is provided. Average score from 17 guest reviews: 8.7/10. Довольно близко от Милано Чентрале. Мы дошли пешком , с двумя детьми и чемоданом. Апартаменты со своим духом и историей. Это чувствуется в интерьере и обстановке в целом. Хорошая посуда, вся бытовая техника и ощущение, что хозяйка только вышла из дома. l'appartamento è arredato con gusto, accogliente e "vissuto". Adatto a chi non cerca luoghi anonimi e standardizzati. La posizione nei pressi della stazione è comoda e la zona è simpatica. Очень понравилась квартира оригинальностью дизайна: использование в декоре антикварных элементов придает ей особый, неповторимый шарм. И в то же время современная, хорошо обустроенная кухня, чистая ванная комната, удобная кровать делают пребывание здесь очень комфортным. Нельзя не упомянуть и террасу, которая добавляет уюта. Posizione, l'appartamento molto grande, molto pulito e Ilaria la proprietaria molto gentile e disponibile. Kaunis ja erinomainen varustelutaso, bonusta perus- mauste/ tee/ valikoimista. Kauniit astiat, kaksi mutteripannua! Erityiset kiitokset hiustenkuivaajasta ja lainattavista kosmetiikasta, kuten shampoo ja käsivoide. Situated 1.1 km from Duomo Milan and 1.3 km from Sforzesco Castle, Keith Apartment offers accommodation in Milan. The unit is 1.3 km from La Scala. Free WiFi is provided throughout the property. Average score from 65 guest reviews: 8.6/10. The design of the apartment is very nice and it is situatied in a vibrant area of the city. The view from the apartment is beautiful. Lots of shops around and places to eat, I recommend! The apartment was gorgeous with a very comfortable bed, great shower and AC. Right next to us was a Cafe / Bar which was an awesome bonus. We went there at night for a night cap and got our coffee there in the morning. The apartment has a great central location in a young buzzing area with a choice of great restaurants close by. Perfect place to spend a few days since the apartment has everything one needs including a small kitchenette. Very close to Collone! Closer than expected, private and clean, cheaper than the competition! Great view! Valentina and Stefano are very gracious hosts! They made things very easy for us and provided us with all the help we needed. Excellent location for a younger person. Good Wi-Fi. Friendly staff. Late check-in was not a problem. Good communication and contact upfront. Excellent location for young people as the area (next to the flat) is the meeting spot at night for hundreds of youngsters to have a nice quiet drink (Noise is not a problem here). You are right into the center of a trendy neighbourhood. Breakfast, food, independent fashion shops a few steps away. Not in the overcrowded center of Milan. The location was great, easy access to all the sites of the city and dual aspect views from the top floor of a traditional Italian building. The owner was very accommodating and responded timely when contacted. 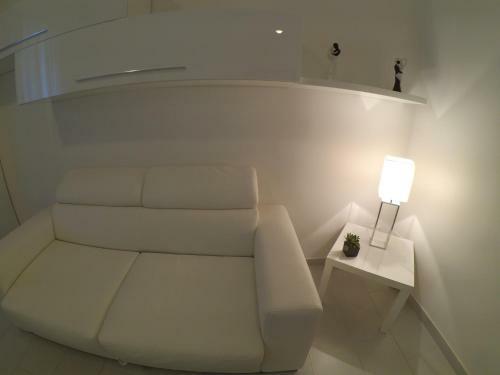 Located 2 km from Milan Fashion District in Milan, this air-conditioned apartment features free WiFi. The property features views of the city and is 2.1 km from Villa Necchi Campiglio. Average score from 16 guest reviews: 8.5/10. Almost everything in it are perfect. Especially theybare always there when I need help. At the end of my journey I need to ship stuffs from Milan back to Australia, they help me with everything including when custom called them and ask about the shipmeny. 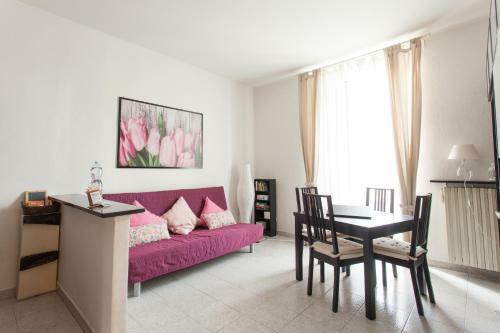 Very nicely furnished, spacious and clean apartment just across the road from Milan Centrale Station. 편안했고 아주 넓었으며 쾌적했다. 귀족의 성 같은 느낌? 더 오래 있고 싶은 생각이 들었다. 역 바로 앞이라 위치도 좋다. 만약 밀라노 아웃이라면 이곳이 최고 걸어서 50m면 공항버스가있다. 슈퍼도 중앙역과 고작100m떨어져있으니 좋고 버스정류장이집앞 일층에 중국슈퍼가있는데 한국식품 간단한것은 다 있으니. . 시설은 크고좋습니다. 따뜻하기까지. . 직원도 친절합니다. 언급되지않았던 보증금을 받는데 그것은 미리 알지못한거라 기분이좋지않지만 그래도 그거빼고는. . 참. . 밀라노 트램은 밤새다닙니다. 혹시 예민해서 잠자리가 예민하신분은 심각하게 고민하세요. . 밤새 10분마다 트램이지나갑니다. 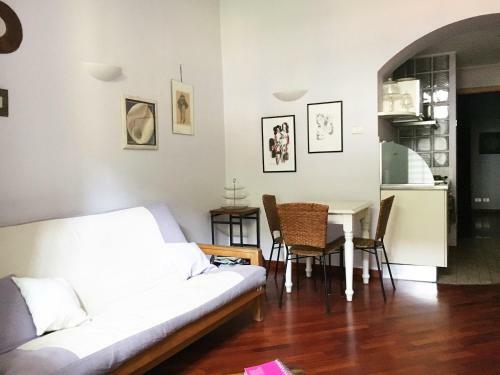 Located 3 km from Ospedale Niguarda in Milan, this apartment features free WiFi. Guests benefit from terrace. The kitchen features a dishwasher, an oven and a microwave, as well as a coffee machine. Average score from 11 guest reviews: 8.5/10. La gentilezza di Vanya... top! Appartamento molto carino e pulito non mancava niente. Libreria molto ben fornita. Da consigliare. L'espai és molt càlid i acollidor, ple de detalls que el fan molt especial, hi ha una atenció en les petites coses que m'encanta!, cadascuna d'elles sembla especialment triada per resultar agradable, per fer que et trobis a gust. També és excepcional el tracte personal amb V., sempre molt atent, que es va preocupar per a que la meva estada fos comfortable i que en tot moment em va brindar el seu ajut. Grazie mille!!! Accoglienza ottima, gentilezza e tanta disponibilità! Fermata della Metro "Turro" (Linea rossa) nei pressi dell'appartamento. Ci è anche stato lasciato l'occorrente per fare colazione. Appartamento con arredamento moderno e tenuto molto bene. La comunicazione con i responsabili è stata ottima e facile, e lo staff è sempre stato a disposizione per rispondere alle nostre richieste. Ben accessoriato e comodo. Bel terrazzino. Vicino metro. Proprietario molto cortese ma non rilascia ricevuta. 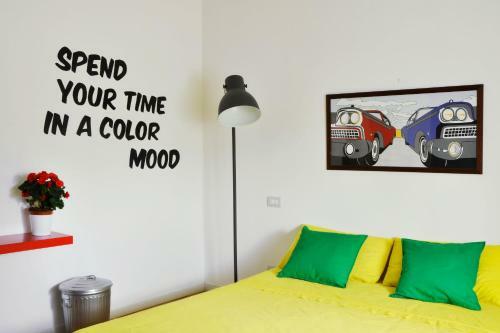 buona posizione, appartamento curato e spazioso, bel terrazzo. Featuring free WiFi throughout the property, Aiello Rooms offers accommodation in Milan, 220 metres from St. Agostino Metro Station. Each room at this guest house is air conditioned and has a flat-screen TV. You will find a kettle in the room. Average score from 85 guest reviews: 8.3/10. Fabulous comfortable bed in a lovely clean room! Great location! Very stylish room with all the comforts. New decor and bathroom. Nice touch of chocolate on my pillow and slippers. Great location :Close to main sightseeings and metro station. Very clean This is a room, not an hotel. However, the staff can be reached at anytime if needed. They are indeed very responsive. Everything except quite poor breakfast. Anyway we will definitely stay here again if come the next time. The staff is great, room is clean and cosy, nice pictures on the wall) bathroom is really good. Bed is comfortable. To get a sense for the location: We had a room in a three room (?) apartment turned into hotel room style accommodation in a middleclass residential building with elevator and concierge. No hotel reception. Good access to public transportation (Metro station S. Agostino). Safe, quiet and tidy, modern room, comfortable beds. We were welcomed by friendly staff. I enjoyed the very lovely room, the fridge in the room, the safety box. The neighborhood is safe and quiet. Easy to find. Greeted promptly by helpful staff. Room very clean, comfortable bed, everything worked and convenient (20 min walk or a few tram or metro stops) to the centre. 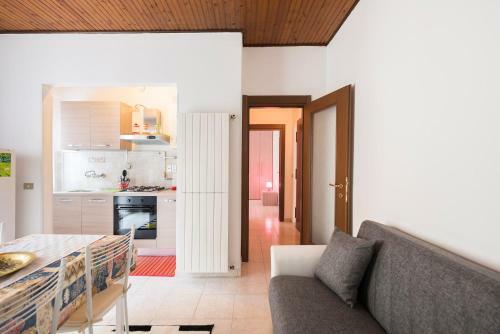 Located 2.1 km from MUDEC, Home 27 offers accommodation in Milan. The air-conditioned unit is 2.8 km from Duomo Milan. Free WiFi is provided throughout the property. Average score from 11 guest reviews: 8.3/10. Residenza S.Event B&B is set in Buccinasco, 8 km from Milan and 44 km from Como. Guests can enjoy the on-site restaurant. Free private parking is available on site. All rooms have a flat-screen TV. Average score from 12 guest reviews: 8.3/10. 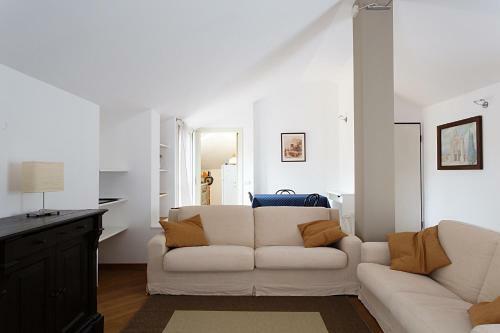 Broggi Apartment offers accommodation in Milan, 500 metres from Navigli and 1.2 km from Duomo Milan. The apartment is 1.5 km from La Scala. Free WiFi is provided throughout the property. Average score from 14 guest reviews: 8.2/10. 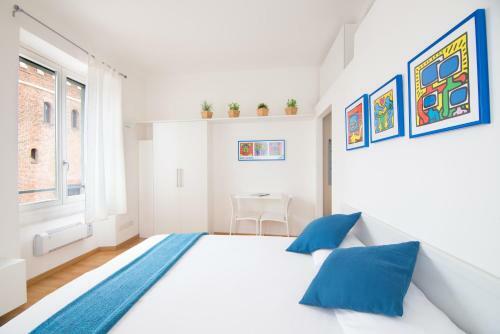 Situated in Milan, Piazzale Baracca Apartment offers self-catering accommodation with free WiFi. The air-conditioned units are 1.2 km from Sforzesco Castle. Average score from 25 guest reviews: 8.1/10. The place is awesome! It is close to center (just 4 stops to Duomo), the area is perfect for shopping and it has park view! All the staff is very nice and friendly. Mr. Manjula was very helpful and kind and we are very grateful to him. The apartment's bohemian design is just amazing and it is very clean! I will definetely stay only here is Milan! 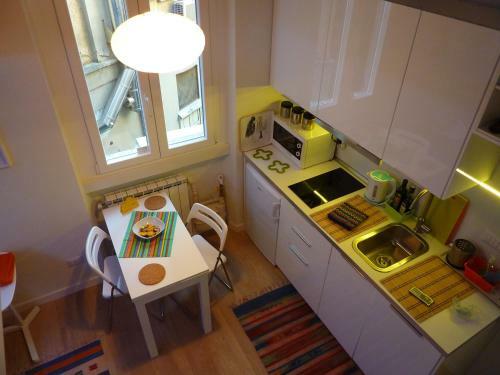 Lovely apartment, great location between central Milan and our visit to the San Siro. Location was great. The apartment is beautiful and very well located. The library and decoration. We should have stayed one night more. La posizione era ottima, metro dietro il palazzo. Navigli a 20 minuti a piedi per chi odia la metro e un supermercato a 10 minuti. Отличное местополежение, мебель по ходу антикварная, очень понравилось. Appartement très bien localisé. 3 stations du Dôme (25mn à pied) 1 station de Cardona (train direct jusqu'à Come) 10mn a pied du Chateau. 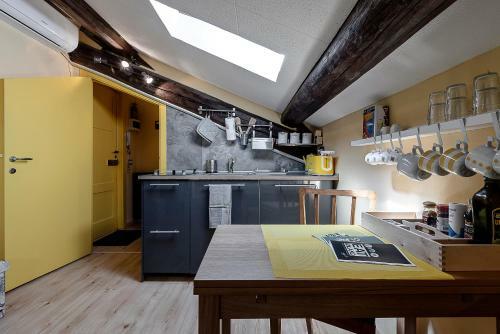 Super appartement : très spacieux, cosy et propre. Léger problème de chauffage, réglé très rapidement. L'équipe Italianway est très disponible et agréable. Appartement idéal pour un séjour à Milan! Рядом с домом станция метро. Недалеко хорошие траттории и рестораны. Рядом супермаркет. Большая площадь апартаментов. Хороший холодильник, духовка, СВЧ. Электрический чайник пришлось отмывать от пригоревшего молока или чего-то ещё. Хорошее местоположение. Верхний этаж, красивый вид из окон. Большие апартаменты, две спальни с одной большой и двумя маленькими кроватями. Большая гостиная. Рядом станция метро и станция такси. 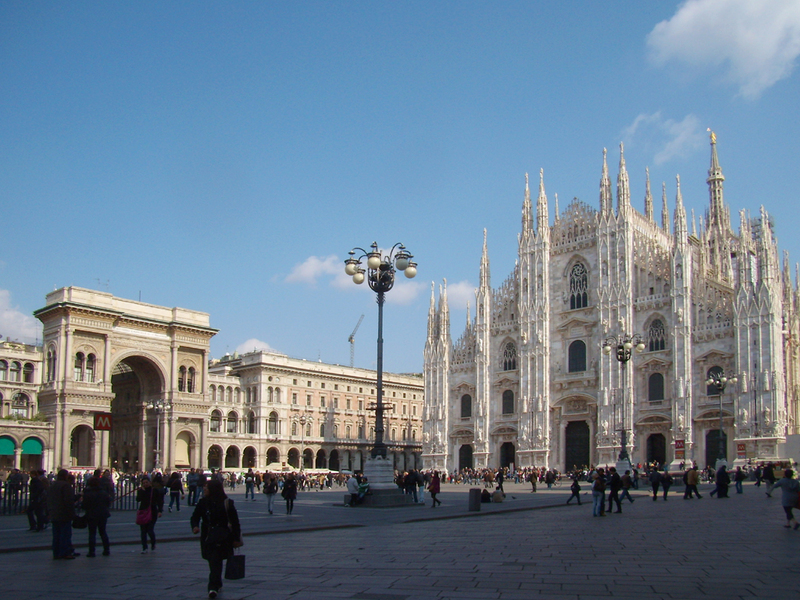 Hintown Walk to the Duomo offers accommodation in Milan, 400 metres from Duomo Milan. The air-conditioned unit is 700 metres from La Scala. Free WiFi is featured throughout the property. Average score from 20 guest reviews: 7.5/10. Location close walk to Duomo, on a very quiet street. Small grocery store around the corner, bigger one about 10 mins walk away. Air conditioning worked well, nice to have in hot summer. Property manager very responsive to email inquiries. Good space for our family of three. Accueil, organisation pour récupérer les clefs car c'est 1 appartement, très bonne situation! Parfait pour se faire à manger sur place et garder les économies pour le shopping ! !! De locatie was ideaal, vlak bij de Dom en de Universiteit. Alle highlights waren dichtbij. Geen last van rumoer buiten. De indeling was verrassend met een hoger gelegen slaapdeel. Vriendelijke ontvangst. Parkeergarage (betaald) vlak bij. L'emplacement de l'appartement à 2 min à pied Del duomo. Cuisine équipée. Literie confortable. Immeuble sécurisé. Duplex original, déco. Rapport qualité prix. Nous avons réservé le jour avant notre arrivée. Nous n'avions pas Bcp de choix en plein juillet. Mais pour 100.- par nuit pour un appartement au centre nous étions satisfait. La ubicación es muy buena. El apartamento es muy acogedor. La posizione centrale.il quartiere tranquillo, il palazzo d'epoca. Offering accommodation with air conditioning, Vesta is located in Milan, 2 km from San Siro Stadium. Fiera Milano City is 2.2 km away. All units include a flat-screen TV. There is also a kitchen, equipped with a dishwasher, microwave and toaster. Average score from 13 guest reviews: 7.5/10. Formentini Apartment offers accommodation in Milan, 100 metres from Brera and 500 metres from Sforzesco Castle. The property boasts views of the city and is 600 metres from La Scala. Free WiFi is offered throughout the property. Average score from 13 guest reviews: 7.4/10. its a very traditional apt, very secure and comfortable, lovely view of the streets below! Excellent location. Proper heating. Nice and well equipped kitchen. Comfortable apartment with wifi. The rental company and location were fantastic and it was very clean. Güleryüzlü ev sahibi her konuda bize çok yardımcı oldu. Brera bölgesinin en güzel evinde kalmış olabiliriz :) Bir dahaki gidişimizde yine aynı tesisi tercih edeceğiz. SPECIAL THANKS TO MARCELLO! La posizione: il meglio che si può chiedere!!!!!!! Прекрасный район, все достопримечательности в шаговой доступности, тихое уютное место. 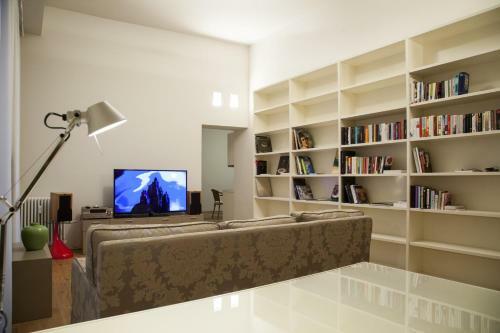 Bramante Apartment is an apartment located in Milan, 500 metres from Arena Civica. The apartment is 1.1 km from Sforzesco Castle. Free WiFi is offered throughout the property. There is a seating area and a kitchen. A flat-screen TV is available. Average score from 12 guest reviews: 7.2/10. Situated 300 metres from Villa Necchi Campiglio in Milan, this air-conditioned apartment features free WiFi and a terrace. The unit is 700 metres from Milan Fashion District. Average score from 45 guest reviews: 9.5/10. Beautiful location! Very nice apartment! Waking distance to most touristic attractions. Supermarket 100m from the apartment! Fantastic terrace with a beautiful view. Apartment is utilated with all you need for long staying. And not in the least, the host Paula was very nice and gave us a map of Milan and and showed us how to get to the main attraction of the city. Fantastic apartment in an incredible location. Waking distance to most touristic attractions. Supermarket with all you need on the next corner. Restaurants, top stores, etc. nearby. Highly recommended. Very big and very clean apartment. The hostess was very kind, she gave us directions through all city. Apartment looked new, plus it suplied everything we needed. Suitable for someone who wants to stay longer. The unit is a quiet attic with lots of light on a great location and a prestigious address. Many power outlets all over the apartment are very handy to charge up mobile phones, laptop computers, etc. Location super. Very pleasant apartment with patios. Sympa and helpful host. Location excellent 5 min from Douomo. Safe place very quite. We loved this apartment, centrally located, good comfort, well equipped with everything you need for a great stay. The guy who gave us the key (Victor) informed us about the apartment and recommended places to visit. Good communication with him, despite our delay. Nos encantó este apartamento, céntrico, buen confort, bien equipado con todo lo que necesitas para una buena estancia. El chico que nos entregó la llave (Víctor) nos informó acerca del apartamento y nos recomendó algunos lugares para visitar. Buena comunicación con él, a pesar de nuestro retraso. Апартаменты просто супер. Даже не ожидали. Огромные, стильные, чистые. есть своя большая терраса. Кухня со всем необходимым. Своих денег точно стоят. Даже жалко, что были там всего одну ночь. Там комфортно жить долго. Featuring free WiFi throughout the property, B&B Luini 8 offers accommodation in Milan, 600 metres from Sforzesco Castle. Some rooms have views of the garden or city. All rooms are equipped with a private bathroom. Average score from 69 guest reviews: 9.5/10. It was amazing. .. we stayed there like someone that is guest in a friend's house ... Valeria was so gentle with us that we left the B&B Luine with desire to be there again... thanks for all.. This B&B was excellent! This was our second time in Milan and this place was so much better than where we stayed last time. It felt like you were visiting friends in their flat in Milan. We had the Superior Suite which had plenty of room. It also had a terrace that would be perfect to enjoy a glass of wine on. The location was great, it was only about a 10 minute walk to Cadorna train/metro station. We had to wake up early to make our flight, and the wonderful hostess insisted on getting up early just to prepare breakfast for us! We would stay here again if we are ever back in Milan. I was very happy to start my Northern Italy journey from this very Italian apartment. It is beautiful and artistic. Guendalina is a great host. I liked her breakfast a lot, which is rich, health and delicious. Since we needed to leave at 7:00am to airport, she got up very early to prepare breakfast for us. 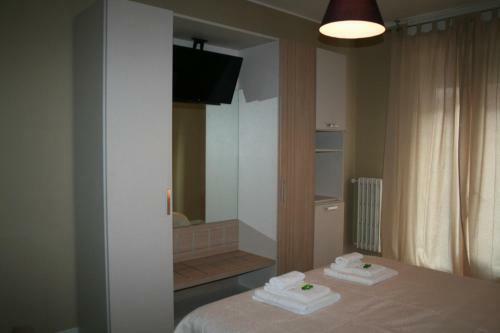 The location is right in the center of Milan with walking distance to key attractions. The only thing need to remind is that the apartment is on the 2nd floor of a building. You need to carefully check the sign on the door. The hostess woke up at 4 am to provide breakfast for us before we left for the airport! The apartment was beautiful, comfortable and very clean. Also, the location was convenient to a parking garage if you have a car! The staff, Rafealla was incredible. She went out of her way to make sure our stay was like home away from home. There are really no words to describe the comfort and thoughtfulness in this B&B. Genuine hospitality, feels like home (with carefully decorated rooms), excellent breakfast, all in the centre of Milan (5 minutes walk to the Duomo). Warm hospitality in a beautiful home. Breakfast was very good as were the unexpected touches such as watermelon or freshly chilled water after hot day walking around Milan. Featuring free WiFi throughout the property, Locanda Pandenus offers accommodation in Milan. All rooms are fitted with a TV. You will find a coffee machine in the room. For your comfort, you will find free toiletries and a hairdryer. Average score from 27 guest reviews: 9.4/10. 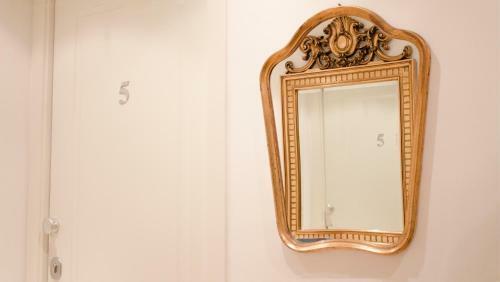 The hotel - located in a very trendy area in Milan - is made of just 2 rooms wonderfully decorated with great design pieces and an incredible attention to details. The bed is very comfortable, the sheets are embroidered with an unexpected writing that made me smile: "Bed love & more". All you may want in an hotel is available: a Smeg fridge, a Nespresso coffee machine as well as bluetooth speakers to play your smartphone playlist. The owner, Pippo, is very keen to make your stay as pleasant as possible. You can order breakfast in the room from the Pandenus shop downstairs or have breakfast directly in the shop - where you can find an array of great croissants and smoothies. I strongly recommend it for both business and leisure. Fantastic restaurants in the area. The bathroom is incredible. Huge tub. Waterfall shower. Ultimate luxury while the room is modern with edge. Would have liked to have spent more than one night here. Luxurious and comfortable. Everything was excellent! !Special thanks to Simon who was very helpful!! !just perfect!! The room was perfect (well appointed, large, clean), the location amazing to visit Milan on foot, and the restaurant/bar which belongs to it very nice with very welcoming landlord. Splendida location al centro di tutto, arredo design e cura di ogni particolare. Complimenti! Da ritornare assolutamente! La locanda e' situata in una zona top di milano e super collegata con mezzi di superficie e non, camere spaziose, pulite e ricche di comfort, al piano terra si possono degustare diverse prelibatezze tipiche del bakery pandenus! Consigliatissimo! Posizionato nel centro della movida milanese. Camere silenziose e spaziose. Curate nei dettagli. Letti comodissimi. Bagni anche. I ragazzi che ci hanno ricevuto sono stati gentilissimi. Colazione ottima e abbondante. Il valore aggiunto è la presenza del ristorante Pandenus sotto. La posizione incastonata all'interno di un palazzo "vero". L'arredamento della stanza davvero fonte di ispirazione. L'atmosfera della locanda a piano terra. Fantastico. Located 700 metres from Duomo Milan in Milan, this air-conditioned apartment features a terrace. 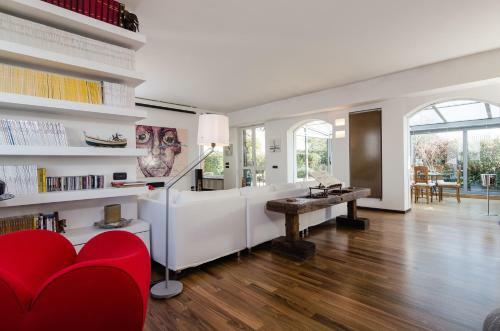 The property is 700 metres from Villa Necchi Campigli. Free WiFi is offered . Average score from 65 guest reviews: 9.3/10. The apartment looks great, I higly recommend to anybody who wants to live in the hearth of Milan to discover the city or just relaxing and enjoying the beautiful balcony. Spacious apartment, aircon, fantastic balcony (not for small children though ). The pictures don' t do it justice. Would recommend highly. Fantastic Penthouse with lots of space and excellent outside area. Location, large spaces in the apartment, good host. Flat is near the center with Duomo, La Scala and other monuments. The housekeeper Simon was very friendly and helpful and his mummy hearty lady. He recommended us good café and where to have tasty dinner or do shopping. Отличное место расположение, своя большая терраса. Очень большая площадь, очень грамотно зонирована. Два сан узла. Lage perfekt, 5 Min.zu Fuß am Dom, schickes ausgefallenes Appartement mit riesen umlaufender Terrasse, Blick auf Spitze vom Dom, super problemlos mit Parkplatz (direkt am Haus mit elektronischem Tor), Dank Simon alles super easy zu klären! El apartamento es una maravilla y la ubicación es excelente a 5 min andando del Duomo. Situated 400 metres from Duomo Milan and 600 metres from La Scala, Duomo Apartment - Galleria Unione is a bright and elegant studio in Milan. It offers beautiful views over over Milan's rooftops, as well as free WiFi and air conditioning. Average score from 20 guest reviews: 9.0/10. Wonderful place to stay near the center also safe for family, I like everything . Very comfortable room. We strongly recommend to stay here for holiday. Super Lage, guter Parkplatz, geräumiges, stilvolles und sauberes Studio, sehr freundlicher Empfang von Massimo. Hat alles bestens geklappt, immer wieder! Extrêmement bien placé et calme. On se croirai à Florence. Top! Impecable, fino, limpio, cómodo y excelente ubicación. Hermosas ventanas con vista extraordinaria, muy luminoso. Con todos los servicios óptimos. Aprovechamos inclusive el lavasecarropa que funcionaba muy bien. Volveria siempre!! Situation géographique. Originalité de l'appartement en mode coffre fort. Avec des portes blindées. Son emplacement très central, sa clarté et sa vue sur les toits de Milan, son calme. Проживали неделю, белье не меняли, не убирались((( утром уезжали ключи отдать некому!!! Место расположения отличное - самый центр. В квартире есть все необходимое. Casa di Giulio offers pet-friendly accommodation in Milan. The unit is 4.1 km from Villa Necchi Campiglio. Free WiFi is offered throughout the property. Average score from 17 guest reviews: 9.0/10. 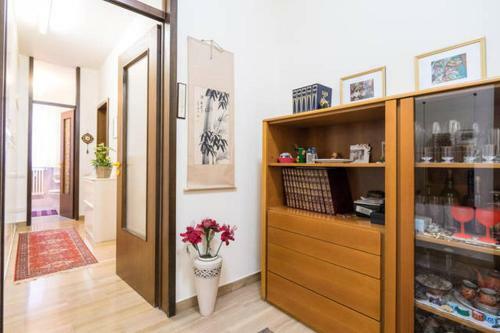 This property is near Piazza Udine and offer a facile acces by Metro to the center city; the personal is very nice and the staff is willing to help you. The property is very clean and has all facilities; the area is quiet and there is a supermarket not far away. I think even the most pretentious people will not have any objections. Excellent. Really confortable place. The owner was really nice with us. The appartment is totally equiped. 5 minutes walking from metro. Apartment very comfortable and equiped with everything you need (stove, fridge, microwave,..). The decoration and room arrangement is really well thought. Subway (which is really good in Milan btw) station just 8 min away by foot. Un piccolo appartamento super accessoriato, pulito e molto curato. Con proprio tutto quello che serve, ci sono la macchina per il caffè, il frigo, la lavatrice, la possibilità di cucinare e un piccolo terrazzo. Comoda la posizione, in una zona tranquilla. Staff molto gentile e accogliente e molto attento ai dettagli. Sehr praktisch für Autoreisende. Leichte Einfahrt und gute kostenfreie Parkmöglichkeiten vor dem Haus. Metrostation ganz in der Nähe. Das Studio ist sauber, geräumig und mit allem Notwendigen ausgestattet. Ein Frühstück auf dem kleinen Balkon ist im Sommer sicher schön. Ruhige Lage. Квартира в 7 минутах от метро Udine, вечером не страшно идти:) Есть все необходимое, даже кофеварка. Быстрый неограниченный интернет! Распечатанный путеводитель на нескольких языках, карта. Гигиенические принадлежности. Удобная кровать, уютное постельное белье, в которое хочется зарыться. Хозяин квартиры Antonio был всегда на связи и во всем помогал! Недалеко есть супермаркет Eselunga, режим работы с 8 до 21 (не уверена про выходные). Также есть Coop, Carrefour к северу от квартиры, но они намного дальше. La limpieza y el buen gusto en el arreglo del Studio. Realmente lo pasamos muy bien. Il monolocale è molto accogliente e c'è tutto quello che serve. Set 1.7 km from Milan Fashion District in Milan, this apartment features a balcony with city views. The apartment is 1.8 km from Brera. Free WiFi is available throughout the property. Average score from 642 guest reviews: 8.6/10. 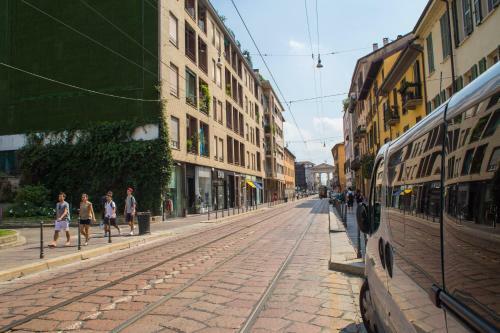 Fifty House features a bar and air-conditioned rooms with free WiFi, just a 2-minute walk from Milan's Piazza Cinque Giornate square that offers tram links to the heart of the city and the lively Navigli area. Average score from 345 guest reviews: 8.5/10. I was given a complimentary room upgrade which I thoroughly enjoyed. I loved the modern individualistic decor and the warm hospitable atmosphere. The staff was extremely helpful and welcoming. The breakfast buffet was stunningly beautiful with four types of juice, bottles of champagne, smoked salmon, eggs and bacon, many cereals, yogurt, cheese, croissants, and several types of bread, as well as any type of coffee one would want to enjoy. The suite we rented was comfortable, so were the bed and bathroom with lovely toiletries, bidet, even a shoe horn and shoe kit! 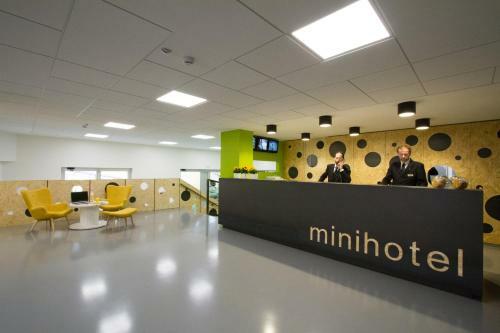 Amazing comfortable hotel with incredible design and the best staff! It was pleasure to stay at Fifry house, I had wonderful room with comfortable bed, the restaurant nearby was excellent too! Everything is perfect.Clean & good decoration.thanks to Mr.Andrea and all staff. The personalized assistance upon our arrival. The room wasn't ready so they were able to fixi it sending is for lunch and doin an upgrade of our room! The art in the hotel is very well curated and the breakfast is perfect! The staff is really on top of all your needs and they are always avaiable for you. Everything was great! The staff was very kind and helpful at anytime! Very well located. Different from usual 5 star hotels, in a nice way. You feel as if you are a guest of posh friends rather than a client in a business. I loved it. Set 500 metres from Duomo Milan in Milan, this air-conditioned apartment features free WiFi and a terrace. Featuring free private parking, the apartment is 700 metres from La Scala. The kitchen features a dishwasher and a microwave. Average score from 267 guest reviews: 8.5/10. Situated in Milan, George Washington Apartment offers self-catering accommodation with free WiFi. The air-conditioned unit is 700 metres from MUDEC. There is a seating area, a dining area and a kitchenette equipped with a dishwasher. Average score from 15 guest reviews: 8.2/10. Set in Milan, this air-conditioned apartment features a terrace. The unit is 200 metres from Villa Necchi Campiglio. Free WiFi is available throughout the property. The kitchen comes with a dishwasher, an oven and a microwave, as well as a kettle. Average score from 21 guest reviews: 8.0/10. Check in was good. Deshan from ItalianWay was prompt and the check in process was seamless. Great value for money in Milan. Just 10 min walking to the city centre and really well cleaned. The apartment was well furnished and in good location. Большая квартира даже для двоих, большая терраса, приветливый консьерж, за углом отличная кондитерская с вкусной выпечкой. Хорошее месторасположение. С удовольствием бы остановились там еще. Расположение шикарное, до основных мест пешком в районе 10-15 минут , но какие это прекрасные минуты! )очень красивый и тихий район , рядом метро и кафе , не говоря уже про главный собор и модный квартал . В 5 минутах супермаркет , где очень демократичные цены и прекрасный выбор и продуктов и винотеки). Жить на крыше было необычно , но очень романтично . Вид на каминные трубы и фасады ближайших домов , завораживал . В квартире есть все необходимое , всё очень продумано . От интерьера до набора посуды( который не один). Удобные кровати , шикарный подушки и одеяла . И такая тишина ... Мы бы хотели там жить всегда ). Значит обязательно вернёмся ! literie très confortable, appartement spacieux, baignoire, Wifi, TV grand écran, 2 WC, quartier très calme tout en étant proche des principales attractions touristiques. Très agréable de s'y reposer après une journée de visites ! Очень необычный дом.Ашан очень приятно встретил и терпиливо ждал прибытия☺. Рекамендую! Удобно расположены, самый центр города. Живёшь в мансарде под крышей - романтично))) Рядом супермаркет. Вся техника в наличии. Located in the P. Vittoria district in Milan, this air-conditioned apartment is 1.2 km from Villa Necchi Campiglio. Scenografico attico con terrazzo boasts views of the mountain and is 1.7 km from Duomo Milan. Average score from 311 guest reviews: 8.0/10. Located in Milan, this air-conditioned apartment features a balcony. The unit is 700 metres from MUDEC. Free WiFi is offered throughout the property. There is a seating area and a kitchenette complete with a dishwasher and an oven. Average score from 12 guest reviews: 7.6/10. 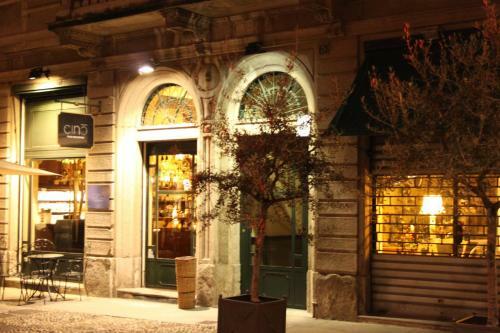 Chambre de bonne S. Ambrogio offers accommodation in Milan, 1 km from Sforzesco Castle. 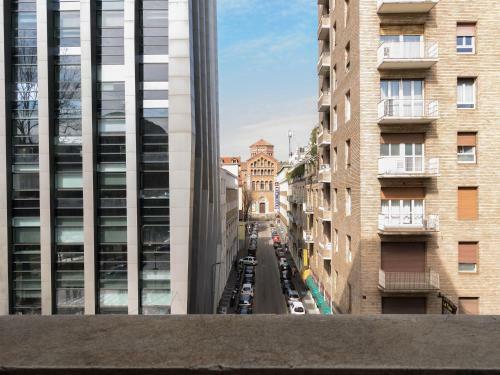 The property boasts views of the city and is 1.1 km from Duomo Milan. Free WiFi is available throughout the property. Average score from 9 guest reviews: 7.3/10. While partly destroyed by Second World War bomb raids, the city has rebuilt itself into a thriving cosmopolitan business center. At the same time, Milan is known for its emphasis on la dolce vita -- a lifestyle of enjoying worldly pleasures: a paradise for shopping, football, opera, and nightlife. Milan is considered the most modern of all Italian cities, but it still keeps its history, and especially its art, intact. Milan is one of world’s great cities to see art, offering a large variety of art museums, mainly of Italian Renaissance and Baroque. The most famous painting of all is site of all is Last Supper” by Leonardo da Vinci. This is located in Church and Dominican Convent of Santa Maria delle Grazie, which together with the painting are a World Heritage Site. There are many other museums that feature Rennaissance and Baroque art, and some that focus on modern styles. This is the oldest and most historic part of Milan. This is where the original Roman Imperial era of Milan was settled, centered on the piazza San Sepolcro. In this area you'll find lots of roman archeological sites, like the one dedicated to the circus, the theater, the imperial palace and the imperial coin. Visitors will find many ancient churches, like Santa Maria alla Porta (Baroque jewel, facade by Richini), as well as other historic landmarks: San Sebastiano civic temple, San Giorgio al Palazzo, Santa Maria Podone, San Maurizio al Monastero Maggiore, the Archeological Museum and its ancient roman wall tower, San Sepolcro and San Sisto.